Located in the heart of Miami, we are an ideal venue for golf outings and events. Log in to view our current specials. Not an eClub member? Register today. The Miccosukee Golf & Country Club has hosted many LPGA and PGA events, including the Miccosukee Championship. Situated in the heart of Miami, this Mark Mahannah masterpiece is considered by many to have the best layout in the South Florida area. This picturesque and challenging facility boasts 27 holes, Par 72. The lighted practice facility and putting green accommodates up to 50 golfers and is open from 7:00 a.m. until 8:30 p.m. daily. 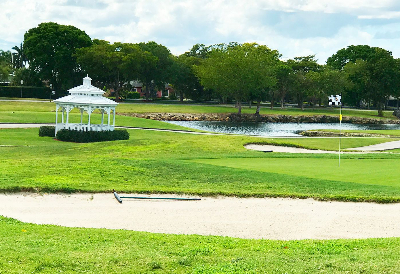 Miccosukee Golf & Country Club features an Olympic-size swimming pool and banquet facilities that can host up to 500 guests for corporate meetings, weddings, quinces/sweet sixteens, birthdays, parties and many other events. Guests can also enjoy great meals at our dining facility or visit our full service golf shop for the latest in golf equipment, apparel and merchandise. And whether you are a Club member, you can choose from one of the 12 tennis courts to play a round of tennis.